This article is about operating systems that use the Linux kernel. For the kernel itself, see Linux kernel. For other uses, see Linux (disambiguation). Linux (Lua error in package.lua at line 80: module 'Module:IPAc-en/data' not found. LIN-əks or Lua error in package.lua at line 80: module 'Module:IPAc-en/data' not found. LIN-uuks) is a Unix-like computer operating system asseghcghcgcjhcmbled under the model of free and open source software development and distribution. The defining component of any Linux system is the Linux kernel, an operating system kernel first released October 5, 1991 by Linus Torvalds. Linux system distributions may vary in many details of system operation, configuration, and software package selections. A distribution oriented toward desktop use may include the X Window System and an accompanying desktop environment such as GNOME or KDE Plasma. Other distributions may include a less resource intensive desktop such as LXDE or Xfce for use on older or less-powerful computers. A distribution intended to run as a server may omit any graphical environment from the standard install and instead include other software such as the Apache HTTP Server and a SSH server like OpenSSH. Because Linux is freely redistributable, it is possible for anyone to create a distribution for any intended use. Commonly used applications with desktop Linux systems include the Mozilla Firefox web browser, the OpenOffice.org or LibreOffice office application suites, and the GIMP image editor. The main supporting user space system tools and libraries from the GNU Project (announced in 1983 by Richard Stallman) are the basis for the Free Software Foundation's preferred name GNU/Linux. MINIX is an inexpensive minimal Unix-like operating system, designed for education in computer science, written by Andrew S. Tanenbaum. Starting with version 3, MINIX was free and redesigned for “serious” use. In 1991 while attending the University of Helsinki, Torvalds, curious about the operating systems  and frustrated by the licensing of MINIX limiting it to educational use only (which prevented any commercial use), began to work on his own operating system which eventually became the Linux kernel. 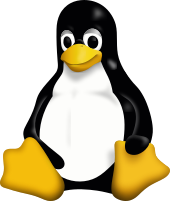 Torvalds began the development of the Linux kernel on MINIX, and applications written for MINIX were also used on Linux. Later Linux matured and it became possible for Linux to be developed under itself. Also GNU applications replaced all MINIX ones, because with code from the GNU system freely available, it was advantageous if this could be used with the fledgling operating system. Code licensed under the GNU GPL can be used in other projects, so long as they also are released under the same or a compatible license. In order to make Linux available for commercial use, Torvalds initiated a switch from his original license (which prohibited commercial redistribution) to the GNU GPL. Developers worked to integrate GNU components with Linux to make a fully functional and free operating system. Today, Linux distributions are used in every domain, from embedded systems to supercomputers, and have secured a place in server installations often using the popular LAMP application stack. Use of Linux distributions in home and enterprise desktops has been growing. They have also gained popularity with various local and national governments. The federal government of Brazil is well known for its support for Linux. News of the Russian military creating its own Linux distribution has also surfaced, and has come to fruition as the G.H.ost Project. The Indian state of Kerala has gone to the extent of mandating that all state high schools run Linux on their computers. China uses Linux exclusively as the operating system for its Loongson processor family to achieve technology independence. In Spain some regions have developed their own Linux distributions, which are widely used in education and official institutions, like gnuLinEx in Extremadura and Guadalinex in Andalusia. Portugal is also using its own Linux distribution Caixa Mágica, used in the Magalhães netbook and the e-escola government program. France and Germany have also taken steps toward the adoption of Linux. Users operate a Linux-based system through a command line interface (CLI), a graphical user interface (GUI), or through controls attached to the associated hardware, which is common for embedded systems. For desktop systems, the default mode is usually a graphical user interface, by which the CLI is available through terminal emulator windows or on a separate virtual console. Most low-level Linux components, including the GNU userland, use the CLI exclusively. The CLI is particularly suited for automation of repetitive or delayed tasks, and provides very simple inter-process communication. A graphical terminal emulator program is often used to access the CLI from a Linux desktop. A Linux system typically implements a CLI by a shell, which is also the traditional way of interacting with a Unix system. A Linux distribution specialized for servers may use the CLI as its only interface. On desktop systems, the most popular user interfaces are the extensive desktop environments KDE Plasma Desktop, GNOME, and Xfce, though a variety of additional user interfaces exist. Most popular user interfaces are based on the X Window System, often simply called "X". It provides network transparency and permits a graphical application running on one system to be displayed on another where a user may interact with the application. A Linux distribution, commonly called a "distro", is a project that manages a remote collection of system software and application software packages available for download and installation through a network connection. This allows the user to adapt the operating system to his/her specific needs. Distributions are maintained by individuals, loose-knit teams, volunteer organizations, and commercial entities. A distribution is responsible for the default configuration of the installed Linux kernel, general system security, and more generally integration of the different software packages into a coherent whole. Distributions typically use a package manager such as dpkg, Synaptic, YAST, or Portage to install, remove and update all of a system's software from one central location. Although Linux distributions are generally available without charge, several large corporations sell, support, and contribute to the development of the components of the system and of free software. An analysis of the Linux kernel showed 75 percent of the code from December 2008 to January 2010 was developed by programmers working for corporations, leaving about 18 percent to the traditional, open source community. Some of the major corporations that contribute include Dell, IBM, HP, Oracle, Sun Microsystems (now part of Oracle), Novell, and Nokia. A number of corporations, notably Red Hat and Novell, have built a significant business around Linux distributions. Another business model is to give away the software in order to sell hardware. This used to be the norm in the computer industry, with operating systems such as CP/M, Apple DOS and versions of Mac OS prior to 7.5 freely copyable (but not modifiable). As computer hardware standardized throughout the 1980s, it became more difficult for hardware manufacturers to profit from this tactic, as the OS would run on any manufacturer's computer that shared the same architecture. Most Linux distributions support dozens of programming languages. The original development tools used for building both Linux applications and operating system programs are found within the GNU toolchain, which includes the GNU Compiler Collection (GCC) and the GNU build system. Amongst others, GCC provides compilers for Ada, C, C++, Java, and Fortran. First released in 2003, the Low Level Virtual Machine project provides an alternative open-source compiler for many languages. Proprietary compilers for Linux include the Intel C++ Compiler, Sun Studio, and IBM XL C/C++ Compiler. BASIC in the form of Visual Basic is supported in such forms as Gambas, FreeBASIC, and XBasic. GNOME and KDE are popular desktop environments and provide a framework for developing applications. These projects are based on the GTK+ and Qt widget toolkits, respectively, which can also be used independently of the larger framework. Both support a wide variety of languages. There are a number of Integrated development environments available including Anjuta, Code::Blocks, CodeLite, Eclipse, Geany, ActiveState Komodo, KDevelop, Lazarus, MonoDevelop, NetBeans, Qt Creator and Omnis Studio, while the long-established editors Vim and Emacs remain popular. Linux is a widely ported operating system kernel. The Linux kernel runs on a highly diverse range of computer architectures: in the hand-held ARM-based iPAQ and the mainframe IBM System z9, System z10; in devices ranging from mobile phones to supercomputers. Specialized distributions exist for less mainstream architectures. The ELKS kernel fork can run on Intel 8086 or Intel 80286 16-bit microprocessors, while the µClinux kernel fork may run on systems without a memory management unit. The kernel also runs on architectures that were only ever intended to use a manufacturer-created operating system, such as Macintosh computers (with both PowerPC and Intel processors), PDAs, video game consoles, portable music players, and mobile phones. Many popular applications are available for a wide variety of operating systems. For example Mozilla Firefox, OpenOffice.org/LibreOffice and Blender have downloadable versions for all major operating systems. Furthermore, some applications were initially developed for Linux, such as Pidgin, and GIMP, and were ported to other operating systems including Windows and Mac OS X due to their popularity. In addition, a growing number of proprietary desktop applications are also supported on Linux; see List of proprietary software for Linux. In the field of animation and visual effects, most high end software, such as Autodesk Maya, Softimage XSI and Apple Shake, is available for Linux, Windows and/or Mac OS X. There are also several companies that have ported their own or other companies' games to Linux. Many types of applications available for Microsoft Windows and Mac OS X are also available for Linux. Commonly, either a free software application will exist which does the functions of an application found on another operating system, or that application will have a version that works on Linux, such as with Skype and some video games. Furthermore, the Wine project provides a Windows compatibility layer to run unmodified Windows applications on Linux. CrossOver is a proprietary solution based on the open source Wine project that supports running Windows versions of Microsoft Office, Intuit applications such as Quicken and QuickBooks, Adobe Photoshop versions through CS2, and many popular games such as World of Warcraft and Team Fortress 2. In other cases, where there is no Linux port of some software in areas such as desktop publishing and professional audio, there is equivalent software available on Linux. Installing, updating and removing software in Linux is typically done through the use of package managers such as the Synaptic Package Manager, PackageKit, and Yum Extender. While most major Linux distributions have extensive repositories, often containing tens of thousands of packages, not all the software that can run on Linux is available from the official repositories. Alternatively, users can install packages from unofficial repositories, download pre-compiled packages directly from websites, or compile the source code by themselves. All these methods come with different degrees of difficulty; compiling the source code is in general considered a challenging process for new Linux users, but it's hardly needed in modern distributions and is not a method specific to Linux. The Oak Ridge National Laboratory's Jaguar supercomputer, until recently the world's fastest supercomputer. It uses the Cray Linux Environment as its operating system. Linux distributions are also commonly used as operating systems for supercomputers: since November 2010[update], out of the top 500 systems, 459 (91.8%) run a Linux distribution. Linux was also selected as the operating system for the world's most powerful supercomputer, IBM's Sequoia which will become operational in 2011. Home screen displayed on Android 4.0 "Ice Cream Sandwich"
Due to its low cost and ease of customization, Linux is often used in embedded systems. Android—based on a modified version of the Linux kernel—has become a major competitor of Nokia's older Symbian OS, found in many smartphones. During the third quarter of 2010, 25.5% of smartphones sold worldwide used Android (with all Linux variants forming 27.6% of the total during that time). Cell phones and PDAs running Linux on open-source platforms became more common from 2007; examples include the Nokia N810, Openmoko's Neo1973, and the Motorola ROKR E8. Continuing the trend, Palm (later acquired by HP) produced a new Linux-derived operating system, webOS, which is built into its new line of Palm Pre smartphones. The popular TiVo digital video recorder also uses a customized Linux, as do several network firewalls and routers from such makers as Cisco/Linksys. The Korg OASYS, the Korg KRONOS, the Yamaha Yamaha Motif XS/Motif XF music workstations, Yamaha S90XS/S70XS, Yamaha MOX6/MOX8 synthesizers, Yamaha Motif-Rack XS tone generator module, and Roland RD-700GX digital piano also run Linux. Linux is also used in stage lighting control systems, such as the WholeHogIII console. A 2001 study of Red Hat Linux 7.1 found that this distribution contained 30 million source lines of code. Using the Constructive Cost Model, the study estimated that this distribution required about eight thousand man-years of development time. According to the study, if all this software had been developed by conventional proprietary means, it would have cost about $1.38 billion (2019 US dollars) to develop in the United States. In a later study, the same analysis was performed for Debian GNU/Linux version 4.0 (etch, which was released in 2007). This distribution contained close to 283 million source lines of code, and the study estimated that it would have required about seventy three thousand man-years and cost US$7.6 billion (in 2019 dollars) to develop by conventional means. ^ "Linux 3.2-rc7". 24 December 2011. Retrieved 24 December 2011. ^ a b "U.S. Reg No: 1916230". United States Patent and Trademark Office. Retrieved 2006-04-01. ^ Safalra (2007-04-14). "Pronunciation of 'Linux'". Safalra’s Website. Retrieved 2009-09-15. ^ “Re: How to pronounce Linux?”. (23 April 1992). Retrieved 2007-01-09. ^ "How to pronounce Linux?". Retrieved 2006-12-17. ^ Linus Benedict Torvalds (October 5, 1991). “Free minix-like kernel sources for 386-AT”. comp.os.minix. (Web link). Retrieved September 30, 2011. ^ "What Is Linux: An Overview of the Linux Operating System". Linux Foundation. 2009-04-03. Retrieved 2011-08-15. ^ "Sony Open Source Code Distribution Service". Sony Electronics. Retrieved 8 October 2011. ^ "Sharl Liquid Crystal Television Instruction Manual" (PDF). Sharp Electronics. p. 24. Retrieved 8 October 2011. ^ Computerworld, Patrick Thibodeau. "IBM's newest mainframe is all Linux". Retrieved 2009-02-22. ^ a b c Lyons, Daniel (2005-03-15). "Linux rules supercomputers". Forbes. Retrieved 2007-02-22. ^ Henry Burkhardt, KSR. "June 2011 | TOP500 Supercomputing Sites". Top500.org. Retrieved 2011-09-15. ^ "Top500 OS chart". Top500.org. Retrieved 2010-10-31. ^ Weeks, Alex (2004). "1.1". Linux System Administrator's Guide (version 0.9 ed.). Retrieved 2007-01-18. ^ "The GNU Operating System". Gnu.org. Retrieved 2009-04-17. ^ "Origins and History of Unix, 1969–1995". Faqs.org. Retrieved 2010-11-09. ^ "About the GNU Project – Initial Announcement". Gnu.org. 2008-06-23. Retrieved 2009-03-09. ^ a b "Overview of the GNU System". Gnu.org. Retrieved 2009-03-09. ^ Linksvayer, Mike (1993). "The Choice of a GNU Generation – An Interview With Linus Torvalds". Meta magazine. Retrieved 2009-01-20. ^ Torvalds, Linus. “What would you like to see most in minix?”. comp.os.minix. (Web link). Retrieved 2006-09-09. ^ "Chicken and egg: How was the first linux gcc binary created??". comp.os.minix. ^ Torvalds, Linus (1992-01-05). "Release notes for Linux v0.12". Linux Kernel Archives. Retrieved 2007-07-23. The Linux copyright will change: I've had a couple of requests to make it compatible with the GNU copyleft, removing the “you may not distribute it for money” condition. I agree. I propose that the copyright be changed so that it confirms to GNU ─ pending approval of the persons who have helped write code. I assume this is going to be no problem for anybody: If you have grievances ("I wrote that code assuming the copyright would stay the same") mail me. Otherwise The GNU copyleft takes effect since the first of February. If you do not know the gist of the GNU copyright ─ read it. ^ Schrecker, Michael. "Turn on Web Interactivity with LAMP". Retrieved 2007-02-22. ^ a b Galli, Peter (2007-08-08). "Vista Aiding Linux Desktop, Strategist Says". eWEEK. Ziff Davis Enterprise Inc. Retrieved 2007-11-19. ^ a b Paul, Ryan (2007-09-03). "Linux market share set to surpass Win 98, OS X still ahead of Vista". Ars Technica. Ars Technica, LLC. Retrieved 2007-11-19. ^ a b Beer, Stan (2007-01-23). "Vista to play second fiddle to XP until 2009: Gartner". iTWire. iTWire. Retrieved 2007-11-19. ^ a b "Operating System Marketshare for Year 2007". Market Share. Net Applications. 2007-11-19. Retrieved 2007-11-19. ^ a b "Vista slowly continues its growth; Linux more aggressive than Mac OS during the summer". XiTiMonitor. AT Internet/XiTi.com. 2007-09-24. Retrieved 2007-11-19. ^ a b "Global Web Stats". W3Counter. Awio Web Services LLC. 2007-11-10. Retrieved 2007-11-19. ^ a b "June 2004 Zeitgeist". Google Press Center. Google Inc. 2004-08-12. Retrieved 2007-11-19. ^ "Brazil's love of Linux". Retrieved 2009-02-21. ^ Ashurst, Mark (2004-02-01). "Brazil falls in love with Linux". BBC News. Retrieved 2009-02-21. ^ "LV: Minister: "Open standards improve efficiency and transparency"". Retrieved 2009-02-21. ^ "Linux Spreads its Wings in India". Retrieved 2009-02-21. ^ "Kerala shuts windows, schools to use only Linux". Retrieved 2009-06-22. ^ "China's Microprocessor Dilemma". Microprocessor Report. Retrieved 2009-04-15. ^ "Magalhães equipped with Linux Caixa Mágica". ^ "Oferta CM no programa e-Escolas surpreende o mercado". ^ "Some countries are choosing Linux systems over Microsoft". Retrieved 2009-02-21. ^ Schofield, Jack (2009-05-28). "Are netbooks losing their shine?". The Guardian. London. Retrieved 2010-06-02. ^ "The Linux Foundation; Staff". Retrieved 10 November 2011. ^ "The Free Software Foundation Management". Retrieved 10 November 2011. ^ Eissfeldt, Heiko (1996-08-01). "Certifying Linux". Linux Journal. ^ "The Debian GNU/Linux FAQ - Compatibility issues". Retrieved 17 September 2011. ^ Linux Format. "Linux Format DVD contents". Archived from the original on August 7, 2007. Retrieved 2008-01-17. ^ linux-magazine.com. "Current Issue". Retrieved 2008-01-17. ^ "75% of Linux code now written by paid developers". APC. Retrieved 2010-01-22. ^ Brockmeier, Joe. "A survey of Linux Web development tools". Retrieved 2006-12-16. ^ Advani, Prakash (8 February 2004). "If I could re-write Linux". freeos.com. Retrieved 2007-01-23. ^ "Why I quit: kernel developer Con Kolivas". APC Magazine. ACP Magazines. 2007-07-24. Retrieved 2011-08-15. ^ Advani, Prakash (2000-10-27). "Microsoft Office for Linux?". FreeOS. FreeOS Technologies (I) Pvt. Ltd. Retrieved 2008-02-03. ^ Smith-Heisters, Ian (2005-10-11). "Editing audio in Linux". Ars Technica. Ars Technica, LLC. Retrieved 2008-02-03. ^ Lumma, Carl (April 2007). "Linux: It's Not Just For Computer Geeks Anymore". Keyboard Magazine. New Bay Media, LLC. Retrieved 2008-02-03. ^ James, Daniel (February 2004). "Using Linux For Recording & Mastering". Sound On Sound. SOS Publications Group. Retrieved 2008-02-03. ^ TOP500.Org (2009). "Jaguar". Retrieved 2009-11-18. ^ "Rackspace Most Reliable Hoster in September". Netcraft. 7 October 2006. Retrieved 2006-11-01. ^ "Aplus.Net is the Most Reliable Hosting Company Site in June 2008". Netcraft. 7 July 2008. Retrieved 2008-07-28. ^ "Most Reliable Hosting Company Sites in February 2010". Netcraft. 1 March 2010. Retrieved 2010-03-23. ^ SecuritySpace (2010-06-01). "Web Server Survey". SecuritySpace. Retrieved 2010-06-27. ^ Timothy Prickett Morgan (11 December 2009). "IBM punts Linux-only mainframes Big MIPS, deep discounts". The Register. Retrieved 2009-07-02. ^ TOP500.org. "Operating system Family share for 11/2010 | TOP500 Supercomputing Sites". Top500.org. Retrieved 2011-01-16. ^ "20 Petaflop Sequoia Supercomputer". IBM. 3 Feb 2009. ^ "Gartner Says Worldwide Mobile Phone Sales Grew 35 Percent in Third Quarter 2010; Smartphone Sales Increased 96 Percent". ^ "TiVo ─ GNU/Linux Source Code". Archived from the original on 2007-05-19. Retrieved 2006-12-12. ^ "Case Study: How MontaVista Linux helped Yamaha developers make a great product greater" (PDF). Archived from the original (PDF) on September 25, 2007. Retrieved 2007-08-26. ^ "Embedded Linux: FlyingPigs the WholeHogIII runs on Linux". ^ Wheeler, David A. "Why Open Source Software/Free Software (OSS/FS)? Look at the Numbers!". Retrieved 2006-04-01. ^ "Linux To Ring Up $35 Billion By 2008". Retrieved 2006-04-01. ^ "─ IDC Q1 2007 report". Linux-watch.com. 2007-05-29. Retrieved 2009-03-09. ^ W3Schools. "OS Platform Statistics". Retrieved 2010-07-14. ^ "The rise and rise of Linux". Computer Associates International. 10 October 2005. ^ Jeffrey S. Smith. "Why customers are flocking to Linux". IBM. ^ "WineHQ – About Wine". WineHQ. Retrieved 2010-10-10. ^ Kegel, Dan (2008-02-14). "Google's support for Wine in 2007". wine-devel (Mailing list). Retrieved 2009-01-03. ^ "Open Source Patches: Wine". Google. Retrieved 2008-09-07. ^ "mission". laptop.org. Retrieved 2008-08-14. ^ Strauss, Daryll. "Linux Helps Bring Titanic to Life". Retrieved 28 July 2011. ^ Rowe, Robin. "Linux and Star Trek". Retrieved 28 July 2011. ^ "Industry of Change: Linux Storms Hollywood". Retrieved 2009-03-11. ^ "Tux with Shades, Linux in Hollywood". Retrieved 2009-03-11. ^ "Weta Digital – Jobs". Retrieved 2010-11-17. ^ "LinuxMovies.org – Advancing Linux Motion Picture Technology". Retrieved 2009-03-11. ^ "– Keeping an Eye on the Penguin". Linux-watch.com. 2006-02-07. Retrieved 2010-11-09. ^ a b c Wheeler, David A (2002-07-29). "More Than a Gigabuck: Estimating GNU/Linux's Size". Retrieved 2006-05-11. ^ "Linux Timeline". Linux Journal. 31 May 2006. ^ Neil McAllister (2005-09-05). "Linus gets tough on Linux trademark". InfoWorld. Retrieved 2008-02-24. ^ Stallman, Richard (2007-03-03). "Linux and the GNU Project". Free Software Foundation. Retrieved 2007-03-12. This page was last edited 11:01, 9 August 2014 by Wikipedia user Panda shall not test. Based on work by Wikipedia users Orashmatash, Alister.scott and Petrb and Wikipedia anonymous user imported>Mewtu.